Cindy A. Matthews: Confessions of a Blonde Writer: Smile: Isn't that the name of a Chaplin song? Smile: Isn't that the name of a Chaplin song? A very quick review of episode two, Smile, because I've lost my notes, and I'm coming down with a cold. Achoo! I had big expectations for the second episode after The Pilot, hoping that we'd see more of the Doctor in action making the world a better place and not wearing that dreadful hoodie again. In a way, Smile fulfills some of those expectations and in another way, it doesn't. The hoodie with the Doctor's velvet coat returns (ugh), but it's the least of my worries. The title Smile is the name of a classic song written by the great comedian (and violinist) Charlie Chaplin (and also the name of a funny movie about beauty pageants), but it doesn't bother me really. There's something else nagging at me from my long term memory unaffected by spring allergies. The story premise seems overly familiar. Where have we seen "inanimate objects" come to life and kill/harm humans before? Another one word title comes to mind: Blink. Instead of Weeping Angels, we now have killer Emojibots. The little robots are adorable, but I wish they could have been more noble in their actions and not quite so predictable. Another overly familiar Doctor Who plot scenario--colonists in cryogenic status in danger of waking up and not making it. Remember Tom Baker's The Ark in Space? Okay, so you can't always avoid repeating some set-ups in sci-fi, but could we at least see some more original twists in the set-up? The setting and SFX photography are fantastic (to coin the Ninth Doctor's catch word) in Smile, and I really felt the Doctor and Bill were on an alien world and inside a futuristic building. The chemistry and camaraderie between the Doctor and Bill works well (in spite of her awful hairstyle and both their poor fashion sense). One would hope with good acting and great production values the script-writing would live up to these high standards, but it's not quite there. Yet. I live in hope of episode three. Will the story quality match the quality of execution? We'll see. 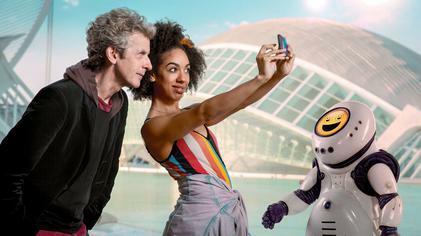 What is your opinion so far of Doctor Who this season? Leave a comment below if you like. Thanks. P.S. I'm finishing up my edits for the re-release of Loving Who. Can't wait for you to see it--all the adventure, comedy and romance a Whovian craves in one novel! It seemed a mash-up of several episodes. The swarming things reminded me of the vashta nerada from Silence in the Library. There was the Ark in Space element, Robots of Death, and Blink. Good acting, good production values, but script-wise... hmm. It was nice to see Mina Anwar who played Gita Chandra in The Sarah Jane Adventures.